Dual X-ray absorptiometry (DXA) is the preferred technique for measuring bone mineral density (BMD). DXA has also been called dual energy X-ray absorptiometry, or DEXA. DXA is relatively easy to perform and the amount of radiation exposure is low. 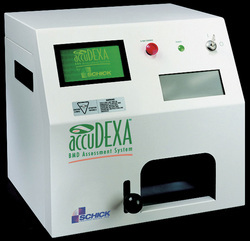 An accuDEXA scanner is a machine that produces two X-ray beams, each with different energy levels. One beam is high energy while the other is low energy. The amount of X-rays that pass through the bone is measured for each beam. This will vary depending on the thickness of the bone. Based on the difference between the two beams, the bone density can be measured. Our clinic can accurately determine your bone density using this test and the great thing about it is that it takes only a few minutes. The procedure x-rays a finger on the non-dominant hand (see middle picture above), so very low exposure.